Another great savings with this $1.00 off coupon and another great Product from Vetri-Science. Nu-Cat Senior Bite-Sized Chews is a product that is comprehensively formulated to help support your geriatric cat’s cardiovascular, liver, cognitive, eye joint and digestive functions. It even includes Taurine to help support many organ functions such as the heart, liver and brain. As you might have expected, Vetri-Science has used their over thirty years of experience to put this pure and most reliable product on the market to help support your pets needs. Whether your cat is just old or it has had some health related issues do to aging, this product might work well for them. Sometimes older cats have difficulty digesting foods. This can cause a weight loss. Check with your vet first but it is likely they will agree that given weight loss due to old age, this great supplement may help. Feel confident with Vetri-Sciences high quality products and reviews. Cats loves these and they are helpful to their nutritional needs. 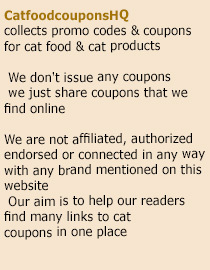 Help them get what they need with this great Coupon for $1.00 off Nu-Cat Senior is specifically formulated for geriatric cats by Vetri-Science. This entry was posted in Vetri-Science Laboratories. Bookmark the permalink.